ABOUT THE GAME	Modern day in Africa. A terrorist organization has overrun one of the small African countries. The French Foreign Legion is to stop the aggressor before they manage to use a weapon of mass which they threat to set off. KEY FEATURESUse modern fire arms and special Ops technics allowing to quickly and efficiently locate and eliminate the enemy. Use advanced warfare equipment, i… ncluding nightvision goggles, M84 flashbangs or S10 gas mask.The modified JupiterEX Engine delivers astonishing graphics that immerses the player in a realistic world of stunning detail, dynamic lighting and breathtaking effects. A covert firing system that allows the player to “blind fire” from behind walls or low obstacles. Bullet penetration: the player can shoot ennemies - and be shot - through thin walls, adding a further tactical element. Weapon modification: the player can modify his main firearm for maximum results (sniper mode to assault mode at any time during the game). 8 different missions. 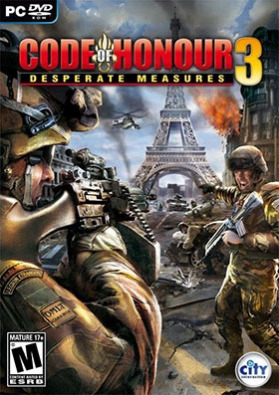 SYSTEM REQUIREMENTS Before installing Code of Honor 3, you should first make sure that your computer meets the basic system requirements: Windows XP/2000 or Windows VISTA DirectX 9.0c or higher (included)) Pentium 4 2.0GHz processor or equivalent 1 GB RAM (Windows XP/2000), 1,5 GB RAM (Windows VISTA) GeForce 7600 GT or Radeon X1650 PRO 256 MB graphics card 3.0 GB of free hard drive space for installation 16-bit sound card with EAX 2.0 compatible with DirectX 9.0 Mouse Keyboard It is also recommended that you install the latest drivers for your graphics card as well as all the latest service packs for your operating system.